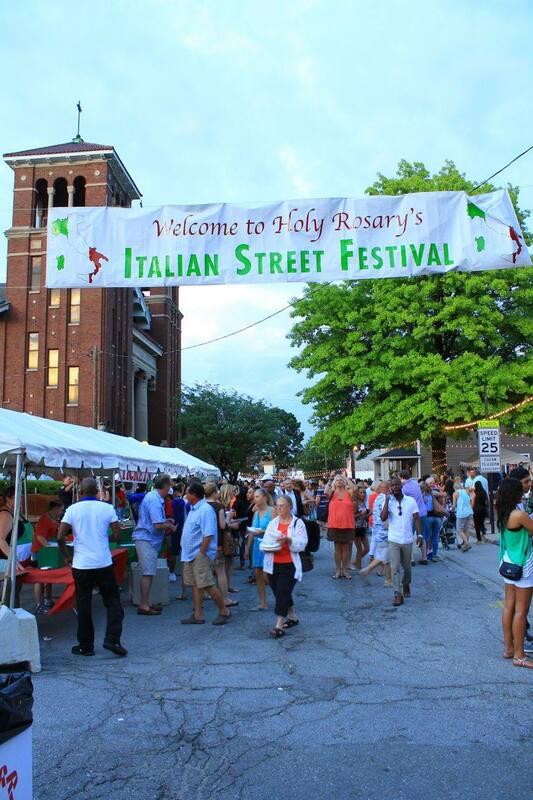 The Holy Rosary Italian Street Festival takes place Friday, June 9th, and Saturday, June 10th, from 5 p.m. to 11 p.m. at the historic Catholic Church, 520 Stevens St. and surrounding Lacy Park. During the event, the area will transform into an outdoor Italian festival and celebration. Holy Rosary Italian Street Festival takes place June 9 and 10. New to the festival is an exceptional, music line-up, including four of Indianapolis’s most popular acts. Local favorite and Headliner the Woomblies will entertain Festival crowds Friday evening, along with Fort Wayne favorite Oferle. Saturday’s line-up includes Spinrut and the Indy Nile Band beginning at 5:30 p.m. Fans of Caruso and Frank Sinatra and will also be entertained as classic Italian pop music favorites are played over the Festival public address system. The Italian Street Festival features over 25 different Italian meats, pastas, salads and desserts. There also is dancing, carnival rides and games for everyone. Twenty-five food stands in a festive, ethnic setting are decorated with strands of lights, and Italian music and an old-world style procession and Mass add to the ambiance. There is free parking in the Eli Lilly lots on East and New Jersey Streets. On Friday and Saturday afternoon of the festival, the Italian Heritage Society of Indiana will host Bocce demonstrations. All are welcome to play bocce at the courts in Lacy Park, or learn how to play the historic Italian game. The Lacy Park Bocce Courts are located at McCarty and Greer Street at the south end of the Church. Those interested in signing up a team of four to play in the IHSI League should register at www.italianheritage.org. Additionally, there is a 7:00pm mass on Saturday June 10th at Holy Rosary Catholic Church. Before Mass at 6:45 p.m., a colorful, Italian religious procession, with a Blessed Virgin statue, along with priests, servers and members of the Italian Heritage Society that will move through the middle of the food booths. The Italian Street Festival Organizers strive to create a fun, family-friendly environment where one can experience Italian American culture by providing the best in Italian cuisine, entertainment, Italian goods and service. Striving for excellence in promoting the Indianapolis Italian American community, the Parish of Holy Rosary and the City of Indianapolis, Holy Rosary Church and the Italian Street Festival are 501c-3 entities. Proceeds from the annual Festival support the Church Operation Fund.